GelPro Elite is 50% thicker than GelPro Classic and features an exclusive Dual Comfort Core System of therapeutic gel and energy-return foam. Indulge in the extra soft and deep-cushioning support as your feet rest on the world’s most comfortable floor mat. The unique, conforming feel of gel plus foam actually feels so natural that you forget that you are standing. This revolutionary comfort solution is perfect for anyone suffering from back, hip, knee, leg & foot discomfort, plantar fasciitis, osteoporosis or arthritis. Ideal for use in the kitchen, bathroom, laundry room, craft room and at stand-up desks. PATENTED GEL TECHNOLOGY! GelPro Elite features a ¾" core of soothing gel + energy-return foam which dramatically reduces stress, fatigue & discomfort while standing. BEVELED REINFORCED EDGES AND DURABLE CONSTRUCTION: The GelPro Elite cushion comfort mat features beveled edges that will not curl or wear down and protects you from tripping over it. 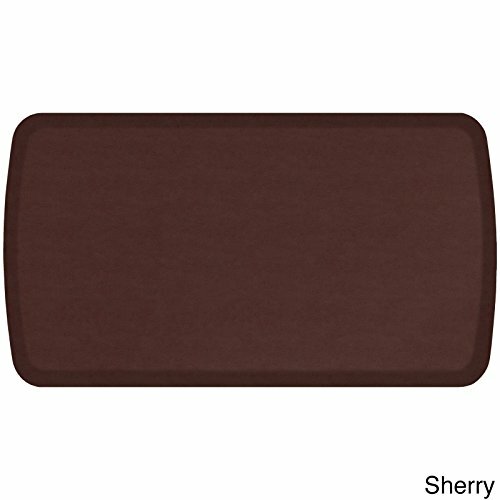 EASY TO KEEP CLEAN: Featuring a stain resistant surface, this chef kitchen anti-fatigue floor standing mat is incomparably easy to keep clean. GUARANTEED: Proudly manufactured in the USA with imported fabric and backed by a 5-year manufacturer's warranty.